Find all necessary supplies for marking metals in this section. Starting from marking felt to replacement parts for your marking operation. 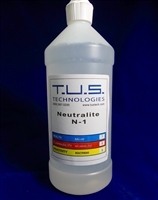 N-1 is our cleaning and neutralizing solution. It can be used with all electrolytes and alloys. Purpose of the N-1 is to remove salts and other reaction products from the marking area. It will bring back the etching area to (about) pH neutral. A quick wipe with a N-1 moistened felt or cloth will be sufficient. Problems with rust on your (stainless or carbon) steel parts after marking? We can help, just send us a quick message in the contact section. Marking Felt is the felt that contains the electrolyte. It is usually wrapped around the marking head. It is used for manual as well as machine marking heads. The Marking Felt comes in a sheet of 15x20 inches and is cut to the required size by the operator with a pair of scissors. The quality of the Marking Felt is critical for the quality of the mark. Our Marking Felt is a TUS development and is exclusively made to our specifications. The manual marking handstamp is used in all manual etching machines. the marking felt is wrapped around the marking head and contains the electrolyte. The handstamp connects to all standard banana plugs, the connection is on the back of the handle. It has a foot print of 1.25x0.75". If you are looking for other dimension, please send us an email under the "about us" section and we will be happy to send you a quote.